A self-proclaimed "laissez-faire" beach-pop ensemble from Victoria with a couple of EPs under their belt, Bridal Party had a big presence onstage — literally. They rocked this gig as a six-person crew, adding an extra keyboardist to their usual quintet, but Bridal Party inadvertently demonstrated that more can be less. For a start, there didn't seem to be a real need for both keyboardists, as one of them mostly played drones, one-handed melodies and occasional shaker. Meanwhile, the co-frontperson thing that Suzannah Raudaschi and Joseph Leroux had going on, both playing guitar and singing lead vocals, felt underwhelming rather than focal. Their harmonies didn't exactly mesh, given the stark contrast in their vocal timbres, and their fretwork basically underscored the sense of ennui in their lyrics. On the whole, their songs often seemed to peter out at the end rather than coming to a confident conclusion. In their defense, Bridal Party had just finished recording their impending debut album that day, though, so maybe they were a little worn out. 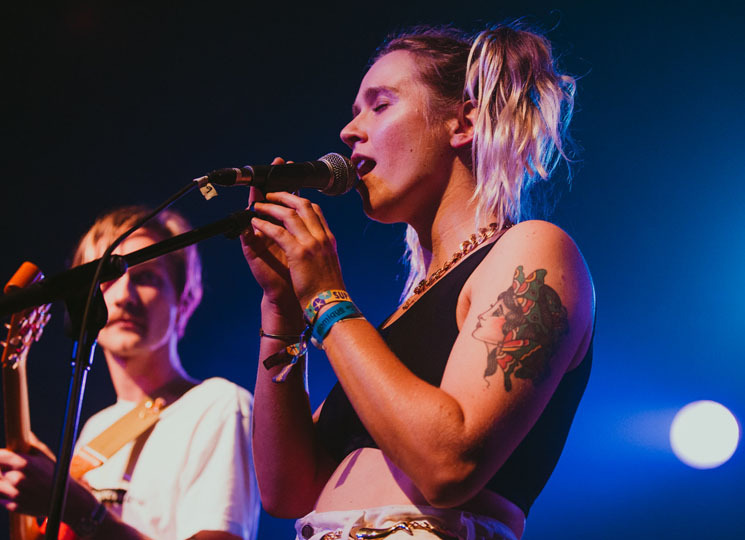 In any case, all the millennials trickling in to fill up the dance floor didn't seem to notice or care, the majority of them gleefully bouncing along to the group's breezy, soul-tinged indie pop nuggets.